The Asian Institute of Technology (AIT) is an international institute of higher learning. It is Asia’s pioneer institution established in 1959 to help meet the region’s growing needs for advanced learning in engineering, science, technology, management, research, and capacity building. AIT’s mission is to develop highly qualified and committed professionals who will play a leading role in the sustainable development of the region and its integration into the global economy. AIT is based in Thailand and has affiliated centers in other parts of the world. The Philippine School of Business Administration, Manila (PSBA-Manila) is a non-sectarian Higher Educational Institution, duly organized and created pursuant to the laws of the Philippines, incorporated in 1966. It is also duly recognized by the Philippine Commission on Higher Education (CHED) and part of the United Nations Educational, Scientific and Cultural Organization (UNESCO) and the International Association of Universities (IAU) so called IAU/UNESCO List. The main rationale of the School is to help meet the country’s management requirements for more advanced and sophisticated industrial and commercial life and government responsibilities as well. PSBA started its research arm for Disaster Risk Management (DRM) researches and projects in 2006 and recently started offering DRM Specialization in its existing MBA program. 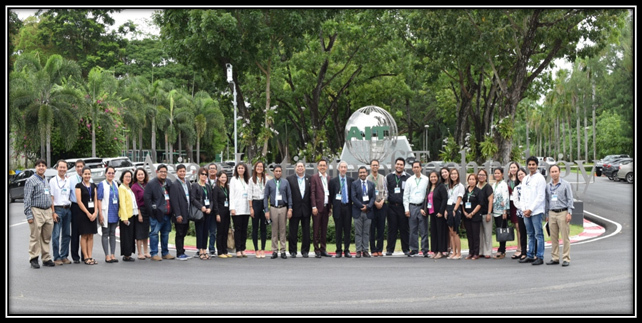 PSBA-Manila is committed not only to the education of Filipinos, but also of other nationalities as well and has cooperative ventures with business schools in Indonesia and Pakistan. Disasters are inevitable and occur globally, affect all sections of the society, and include both natural and man-made disasters. Natural disasters include floods, droughts, earthquake, volcanic eruptions, landslides, avalanches, and forest fires. Man-made or human-induced disasters pertain to disruptive events due to civil unrest, terrorism, or war. Different types of disasters have varied impact on different sectors of an economy. Business enterprise may be small, medium, or large in size, and exist in various sectors of an economy. Business formulates the flow of goods and services and formulates the backbone of an economy. Business includes manufacturing, production, and service sectors. Disaster impacts the business enterprise both locally and globally. Several countries were affected by the 2004 Indian Ocean Tsunami and Japan Tsunami in 2011; Earthquakes in Pakistan (2005), China (2008), Japan (2010), Philippines (2012) and India (2005); Hurricane and typhoons in the USA (2005), Myanmar (2008), Philippines (2013) and Mexico (2017); Volcanic Eruptions in Hawaii (2018) and Indonesia (2010); and Floods in Thailand (2011), Brazil (2010) and Nigeria (2012). Several disasters affect business adversely. The duration of immediate impact depends upon the type of disaster, however, reaching normalcy after the disaster effect should be minimized for achieving resilience from disaster events. Major impacts of disasters on business include: (1) Disruption of production or manufacturing processes; (2) Loss and damages to the stored products, plant and machinery and infrastructure; (3) Decline in sales and demand for goods and services; (4) Loss of employees and their livelihood; (5) Loss of or reduced financial resources; and (6) Mental trauma and stress arising from disaster event. Communication with all stakeholders involved in the disaster management and disaster risk reduction. Disaster Resilience and Business Continuity Planning at various levels for Advocating Safety of Public and Private Hospitals, Schools, and other Critical Structures are one of the key components for mainstreaming resilience and Disaster Risk Reduction in higher education. This workshop will contribute in the exchange of knowledge and dialogues which will help in developing actions and projects for mainstreaming resilience further and thus reducing the risk of disasters. This event being organized at Asian Institute of Technology, Pathumthani, Thailand gives a great opportunity to our institutional corporation to join hands toward the effort in Mainstreaming Resilience and Disaster Risk Reduction in Education. The Philippines is located in one of the most disaster-prone areas of the world. Its location on the western rim of the Pacific and along the circum-pacific seismic belt (Ring of Fire) makes it vulnerable to a range of natural disasters. The international workshop is one of the adoptions of governance, education, and technology. These dimensional frameworks on governance, education, and technology are reciprocally complimentary and strengthening for disaster governance as a consolidated mechanism. Hence, the Philippines is already equipped with various laws, policies, and other legislative tools for disaster governance; but it is the cultural and psychological mindset which is difficult to change. The challenge to evolve and transform from a culture of disaster to a culture of resilience depends not only on the government alone, but on the people as well. "Some Key Issues of Disaster Risk Reduction in Asia"
Prof. Warnitchai discussed how the typhoons and storm surge affected South East Asia. He also discussed how Disaster Warning could’ve prevented a lot more damages. Most importantly, he discussed on how certain building types are very much vulnerable to earthquake collapse and how it could be mitigated by retrofitting said building to be earthquake resilient. Lastly, he discussed that even if we try to predict and mitigate disaster risks, we will still experience them; for that we need to be able to respond to such calls. Disaster Response Plan and the first responders will play a key role during these scenarios. Dr. Ahmad discussed how disasters have been coming more and more often and have become much stronger than it was 70 years ago. This prompted his study on how much every dollar of marginal investment for disaster resilience would save from the disaster cost had there been no action to prevent damages. The findings were that every dollar spent on Disaster Resilience would save the firm or household around $20 dollars in the long run. Mr. Marasigan introduced several projects that the Quezon City-Disaster Risk Reduction and Management Office are currently involved in, including how the National Government is involved in the Disaster Resilience effort with the Local Government. During his talk he also introduced the Disaster Funds Pooling for Local Government Offices. Cdr. Cuña thanked PSBA-Manila and AIT in its effort to educate City Hall employees and scholars of Quezon City about Disaster Risk Management. He also introduced the various efforts the Quezon City Government are taking to minimize the effects of calamity. In addition, he shared his experience in Hawaii and the United States. Dr. Raza showed a video of the Disaster Resilience Efforts with his assistance of Brgy. Rizal, Makati City. He emphazied on equipments for the response team and the early warning devices available. Engr. 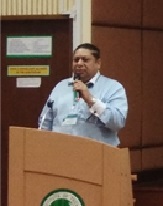 Muktar, as the head of Punjab Provincial Disaster Management Authority, introduced the participants to several preparations of Punjab to possible disasters while also showing the early warning devices in Punjab. Engr. Muktar discussed about the People’s Resilience Framework or how resilient to multiple calamities a district or community is. 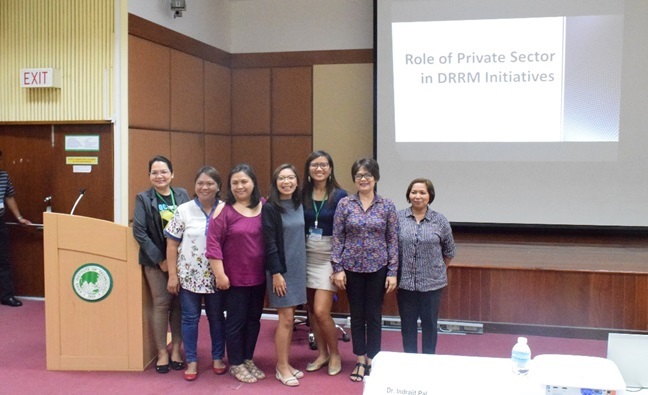 “Role of Private Sector in Disaster Resilience” Dr. Enriquez discussed the important role that private institutions have during disasters and that the government cannot solely take the responsibility in rebuilding and resilience. She discussed further that Corporate Social Responsibility is a big part of private institutions. Dr. Enriquez gave a lecture on how Jollibee, a popular fast food chain in the Philippines, has a relief program prepared in cases of calamity. 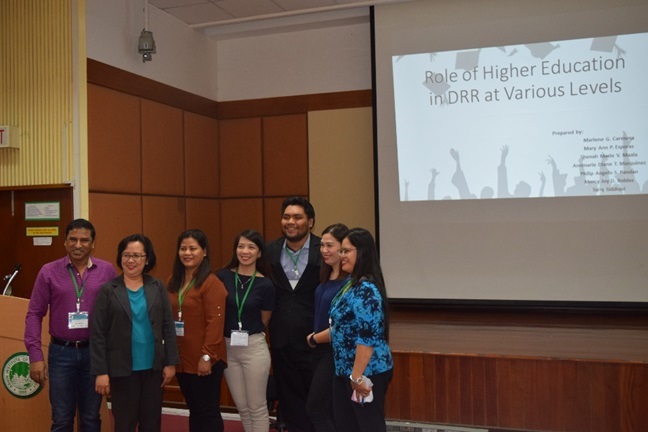 “UP PLANDES: Higher Education Institution and Researches in Disaster Resilience” Ms. Arcilla discussed the efforts that the University of the Philippines (UP) and other Higher Education Institutions are putting into Disaster Resilience and Mitigation. UP PLANADES is producing researches that hopes to aid the planning and preparations to avoid calamitous consequences. “Holistic Planning to Achieve Sustainable Growth among SME’s to Mitigate Risk from Future Flood” Dr. Pathak discussed his thesis about the resilience of Small and Medium Enterprises in natural calamities. In his lecture, he focused on the flood of 2011. He also proposed the idea of balancing resources between economic activities and resilience building. He inferred that there is a need for holistic planning to achieve sustainable growth among SME’s to mitigate any risk from future flood. 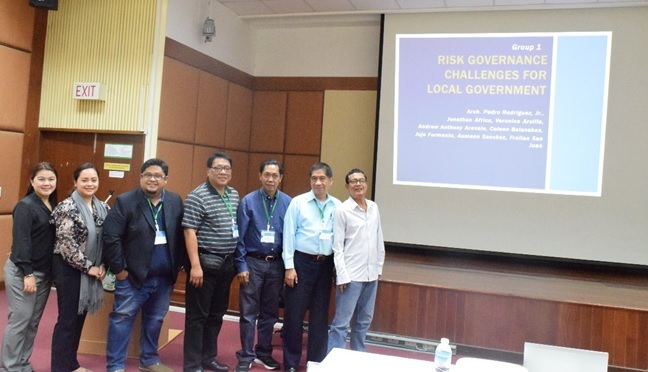 Group 1 discussed the Risk Governance Challenges for the Local Government, focusing on Fund Allocation, Fiscal Management, and Capacity Development. The group also discussed several challenges of implementation in the Local Government and emphasized on Political Will, Restrictive Bureaucracy, and a Monitoring and Evaluation Plan. Group 2 discussed the Role of Private Sector in DRM Initiatives. The group focused on the Private Sectors’ stakeholders and how the company would mitigate the risk they are exposed to. Group 2 looked at the concerns of their customers, employees, and communities around them and discussed how they can build the capacity of each stakeholder. The group also shared that the Private Sector has the possibility of partnering up with Public Sector which enhances the capacity of both sectors. Group 3 discussed the Role of Higher Education in Disaster Risk Reduction at various levels. The group identified three (3) core roles of Higher Education: Conceptualization, Innovation, and Implementation. Group 3 stated that Higher Education is a research facility to expand the horizon of DRR. It is also a knowledge pool wherein policies are taken from. And, lastly, the group also stated that the Higher Education Institutions are core parts of any implementation programs.